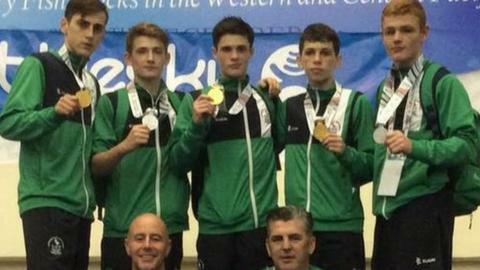 Three Northern Ireland boxers have won gold medals at the Commonwealth Youth Games in Samoa. Three Northern Ireland boxers have won gold medals at the Commonwealth Youth Games in Samoa on Thursday. Bantamweight James McGivern, light-fly Stephen McKenna and light-welterweight Aidan Walsh claimed Team NI's first ever boxing golds at the Games. Tiernan Bradley (lightweight) and Brett McGinty (light-middle) won silvers. Larne swimmer Conor Ferguson won his fourth medal of the Games with silver in the 200m backstroke while Ben Fisher won bronze in the 110m hurdles. Northern Ireland's athletes have now achieved a best-ever medal haul of four gold, four silver and four bronze. Ferguson won gold in the 100m backstroke, silver in the 50m backstroke and bronze in the 4 x 50m relay earlier in the week. Fisher also took bronze in the long jump on Monday.